What’s the problem to be solved? We hear that a lot from Allison, and for good reason. Right now, I hope I’m a solution, not a problem. Earlier this week Allison posted a request for user submissions so she could have more Holiday this Thanksgiving and less Podcast. Hey, I know my Okie drawl can seem tedious to many of you hard chargers out there. Isn’t that why there’s a fast and faster setting on your podcast player? Problem solved. You know how technology that solves one problem can create another? Freud said it so well, “If there had been no railway to conquer distance, my child would never have left town and I should need no telephone to hear his voice.”Back in the dawn of time, my job revolved around a post office box. Income from investments flowed into that box as checks. Correspondence arrived days after posting, and no one expected an instantaneous response. When something was really urgent, there was the telephone, and most of the world tried not to use it when that meant paying Ma Bell’s extortionate long distance rates. Today that investment money mostly arrives pre-deposited into banks and brokerage accounts. Where I could safely let it sit in the U.S. Post Office for days if I wanted a break, well, now the way it builds up could expose my employer to a loss when the amount in a bank exceeds what’s covered by the FDIC. It’s easier to handle than processing a stack of checks, but it’s also like running in place on a treadmill. I’m not going to go all TMI on here, but in the last four months I’ve had more important things to do than process electronic money at my desktop. And yet the tide of money rolls in and must be processed. In short, the technology which changed my job requires a technological response. I’d found myself in a similar situation about three years ago, only worse, because on short notice I had to be out of town for an extended time, and my tech wasn’t ready, much less my selection of clothing. Wandering around a strange city looking for a laundromat with secure WiFi and a power outlet just didn’t cut it. When life returned to more nearly normal, I kludged together a 20,000 mAh battery that would run my Air for hours and bought an LTE MiFi. It was quite a load for a backpack, and I was paranoid about letting it out of my sight. 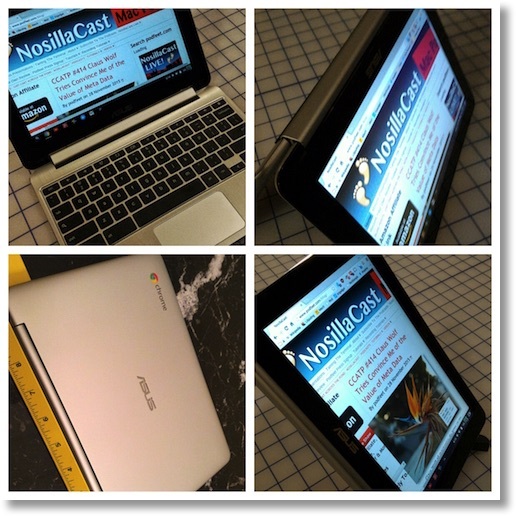 This time I switched out the Air for an Asus Chromebook Flip. Since our workplace uses Google’s “Pro” Apps, a Chromebook is a great tool for accessing the Google services we use. Chromebooks, if you’re not aware, run an optimized version of Gentoo Linux, and with Verified Boot, are as immune to viruses, trojans, and malware as any commercially available device. Why the Flip in particular? Its 1280 x 800 10.1 inch IPS 10 point touchscreen is an improvement over the TFT panel in my current 11” Haswell Air. The Flip is lighter, has longer battery life, and while it isn’t a general purpose computer that will run Photoshop, I was able to import the Android version of the Snapseed Photo Editor, which works well on the Flip’s touchscreen. It works as a very portable access to Google Services where I need it, and as a secure way to log into banks and brokers. Why not a device like an iPad? Had one, wrapped it in a Bluetooth keyboard case, and the result was heavy and awkward. The Flip has a keyboard that’s just shy of full laptop size, and an excellent trackpad to steer the cursor. Its 360 degree hinge enables it to be used as a laptop, a tablet, and in several configurations. The Flip’s shell is real aluminum, not painted plastic. I’m not going frisbee with it, but closed, it’s pretty safe. I’d tried one at Best Buy, which is hardly a good test of any gear, but it seemed fast enough. In my hands, without Best Buy’s marketing overlay, it is plenty fast for what I’m doing. The 1.8 GHz quad core Rockchip ARM processor is up to the task. It’s running AC rated WiFi, Bluetooth 4.1 strong enough to broadcast to a speaker 40 feet away, includes a MicroSD card slot I filled with a 128 GBs on which I’ve stored a lot of Beethoven and Mozart that sounds pretty good through the Flip’s stereo speakers, and even better through a good set of over the ear headphones. The Flip has no issue playing YouTube HD video. After days of varied use, I find the claimed 9 hours of battery life may be optimistic, but it’s good enough I can confidently leave the charger at home for day trips. Here’s some context: $210. That’s the current Amazon price for the 2GB Flip. I paid $279 list for the 4GB version that’s currently on offer for $249. That’s an entire, useful, versatile, and pleasant touchscreen computer with keyboard and trackpad for less than the iPad Pro’s optional “Apple Pencil” and “Smart Keyboard Case.” It’s cheap enough that if you break or lose it, you may be sad, but not bereft. And it is, in the way the first netbooks were made, as inexpensive devices running custom, optimized, versions of Linux from flash memory. Microsoft, terrified that netbooks would spread Linux onto the desktop, set out to own that market by offering very inexpensive XP licenses. Of course, XP wouldn’t run from a small amount of flash memory, so netbooks had to switch to heavier, slower, battery sucking spinning drives. Microsoft also restricted XP netbooks to no more than 1 GB of RAM and a slow single core processors. No wonder the stunningly innovative iPad torpedoed Microsoft’s netbooks. But, hey, Google’s latest Chromebook Pixel LS (for Ludicrous Speed) offers a Core i7, 16 GB of RAM, 64 GB SSD, and 3:2 2560 x 1700 Touchscreen. Definitely a netbook on steroids. And here’s a surprise, that’s not exactly a secret. It’s trivially easy to install the full version of several varieties of Ubuntu on a Chromebook, and Linux right beside ChromeOS. I’ve not done that on my little Flip. First, because to install Ubuntu requires putting a Chromebook into Developer Mode and disabling Verified Boot. Given I’m wandering out into the world and connecting via the Internet to accounts with substantial assets, I’m not disabling Verified Boot. My Flip’s just fine as it came from the factory. On the other hand, I have installed Ubuntu right beside ChromeOS on a lovely i3 2015 Toshiba Chromebook 2. I bought the computer because it’s light, has an excellent full HD 1920 x 1080 screen, backlit keyboard, fast processor, long battery life, and, quite frankly, it’s really cheap. I also bought it because the 16 GB OEM SSD is a standard M.2 it’s pretty simple to upgrade to a much larger one. Before installing the upgraded 256GB-Super-Boot-Drive, I installed the full version of Ubuntu Unity 14.04 Long Term Support, with all its standard software, right beside ChromeOS on the 16 GB OEM drive. To my surprise, it fit nicely there, leaving space for files. Since the Toshiba has an SD card slot that swallow an entire Class 10 card, I slid in a 128 GB. Right out of the box, even without upgrading the SSD, all was good. But when my 256 GB SSD arrived, I shut the machine down, gently removed the battery connector snap from the logic board, and switched out the drives. In less than a half an hour, I’d reinstalled ChromeOS and added xfce Ubuntu beside it on the new, and much larger SSD. I’ve been using the latest version of LibreOffice 5 on that laptop to draft the script for today’s show. Need or want an extremely cheap and very good computer? The Celeron version of the 2015 Toshiba Chromebook 2 offers a 13.3” Full HD IPS screen, backlit keyboard, USB 3, HDMI, and a full SD Card slot that happily slurps in an entire card, all for just $270. The i3 model I recently purchased from Amazon is out of stock there, but available direct from Toshiba with free shipping at the sale price of $379. The i3 Acer Acer C720-3404 comes with an upgradeable 32 GB SSD, but 32’s probably enough to get started. It’s been selling out at Black Friday prices, so watch for it to return. $100 seems to be this Holiday’s Chromebook point of entry. For that you’ll get an 11” name brand Chromebook with Intel Celeron, 2GB of RAM and a 16 GB SSD. Most aren’t upgradeable, but they’ll run ChromeOS just fine, with room to install your preferred verison of Ubuntu Linux right beside ChromeOS. You’ll find links in Allison’s shownotes to information about Chromebooks, and that step by step tutorial how to add the power of Ubuntu to yours. After upgrading my Toshiba’s SSD, I chose the lightweight xfce desktop, with encryption to protect my data. It’s possible and useful to run Ubuntu in a Chrome Tab, but after trying that, I chose not to do that because the way I’m running it is said to be faster and more stable. Important. As the blog post notes, you will probably need a standard external USB keyboard when the install nears completion and asks for a User ID and Password. At that point the laptops keyboard isn’t recognized, but an external USB will work. Final notes: The version of LibreOffice you can install from the Ubuntu Software Center is old. Since the version of Ubuntu you’re installing is 14.04 Long Term Support good through April, 2019, you’ll probably want the latest version of LibreOffice, and want it to update automatically.